Mexico holds an historic election on Sunday: its biggest to date in terms of the sheer number of races. Eighty-eight million registered voters — many of whom are fed up with corruption and inefficiency under the administration of current president Enrique Peña Nieto — will get the chance to change the face of Mexico’s government, and affect the course of U.S. relations, with major border and trade issues at stake. Beyond the presidential race, more than 1600 elected positions at the state and local level are up for a vote across 30 of Mexico’s 32 states — including Mexico City’s mayor — as well as its entire federal legislative body: 500 seats in Mexico’s legislature, and 128 in its senate. But this politically seismic campaign cycle has been plagued by scandal and murder. Violence in local districts has reached unprecedented levels in the runup to the election, resulting in the assassination of 132 political figures since September, including nearly 50 candidates, according to one study. Mexican candidates running for the presidency in 2018 include Andres Manuel Lopez Obrador of the National Regeneration Movement (MORENA), Institutional Revolutionary Party (PRI) presidential candidate Jose Antonio Meade and Ricardo Anaya, presidential candidate for the National Action Party (PAN), leading a left-right coalition. Andrés Manuel López Obrador from the National Regeneration Movement (MORENA) party is the frontrunner by a wide margin. 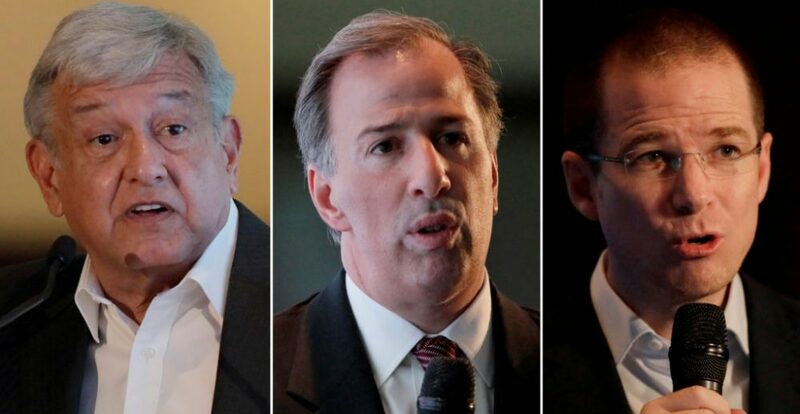 The other three top candidates are Ricardo Anaya from the conservative National Action Party (PAN), José Antonio Meade from the incumbent Institutional Revolutionary Party (PRI) and Jaime Rodriguez, who is running as an independent. López Obrador has led in the polls for the last three months, making trade a cornerstone of his campaign platform by vowing to review the NorthAmerican Free Trade Agreement. Renegotiating NAFTA — or perhaps pulling out — is also a policy priority of President Trump, who has called the pact “the worst trade deal ever made,” and has long targeted Mexico with his ire. He famously launched his bid by decrying the migrants coming across the border (“They’re bringing drugs. They’re bringing crime. They’re rapists. And some, I assume, are good people.”) He has insisted that Mexico pay for a border wall, a demand that has been repeatedly and firmly rejected. 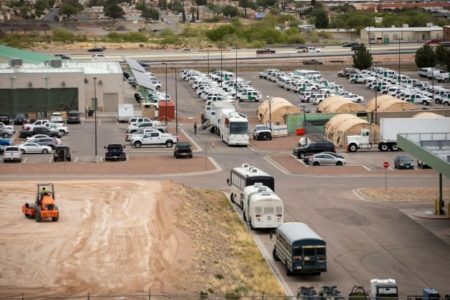 And the separation of thousands of migrant children from their parents at the Mexican border, the result of the Trump administration’s “zero tolerance” policy, has been called “cruel and inhumane” and a “violation of human rights” by Mexican foreign minister Luis Videgaray. 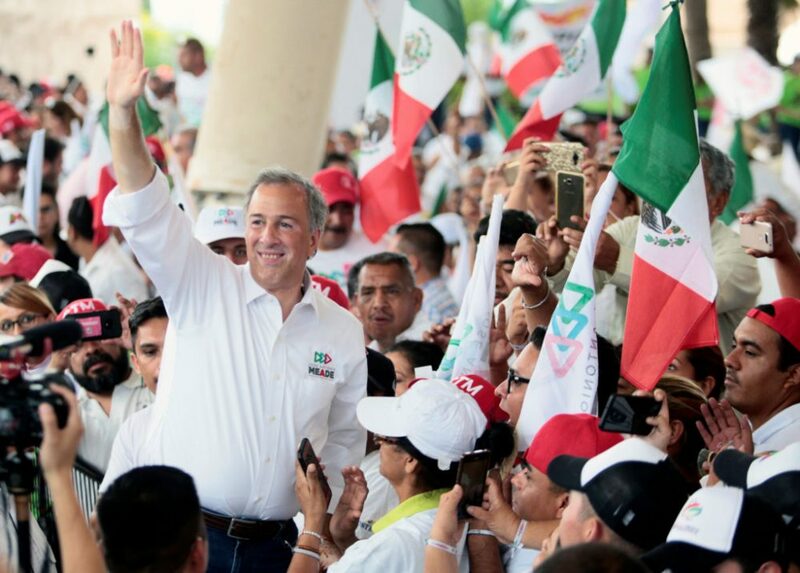 Mexican presidential candidate Jose Antonio Meade greets supporters during a campaign rally, in Saltillo, Mexico. 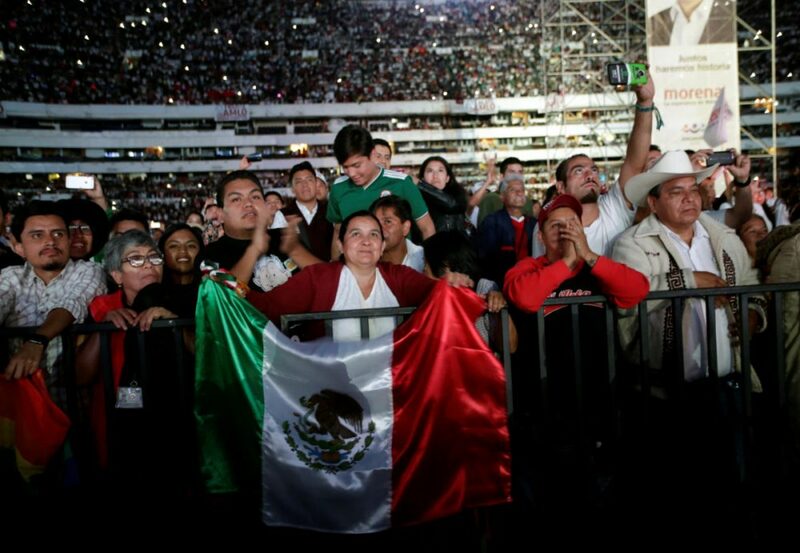 Like many American voters who supported Trump, many Mexican voters see López Obrador, or AMLO as he is known in Mexico, as a populist alternative to a government that’s failed them. AMLO also vows to reassess controversial reforms signed into law by Peña Nieto in 2014 that opened Mexican oil production to foreign and private investors by eliminating the monopoly held by the state-run energy companies. But those who oppose López Obrador worry his economic plans will negatively impact markets and the broader economy. Polls put National Action Party — or “PAN” — candidate Ricardo Anaya in second place, although Jose Antonio Meade, the candidate from current ruling party PRI, has been closing the gap with Anaya. 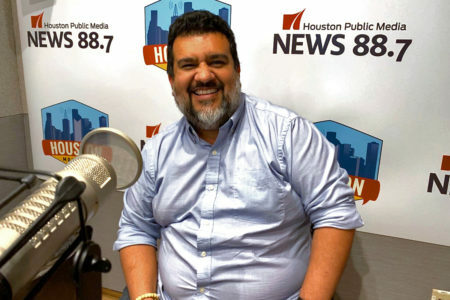 Luis Estrada, founder of Mexican political communications company SPIN said the lack of a solid second favorite could work in López Obrador’s favor. “Since there’s not a clear second place, like any other recent elections in Mexico, there’s no coordination among voters on who would be [in] second place and who would they’d vote for strategically if they find out that their candidate was no longer competitive,” Estrada said. Because the second place race is close, supporters of Meade and Anaya could be too split to mobilize around a single rival for López Obrador, lowering the chance that opponents of López Obrador could strategically vote him out, despite a wide margin. Many Mexican citizens have expressed the need for change during this campaign season. 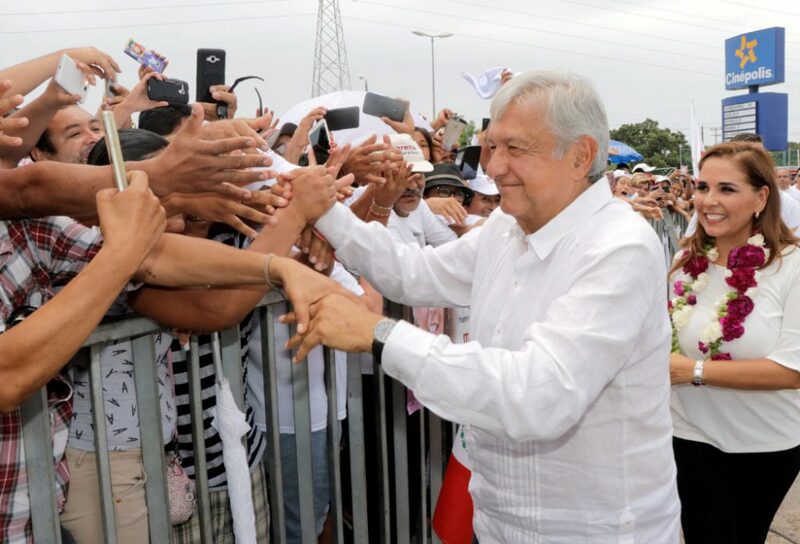 Adrian Duhalt, a postdoctoral fellow in Mexico Energy Studies at the Baker Institute for Public Policy at Rice University, said López Obrador’s lead can be explained by citizens tired of the status quo. 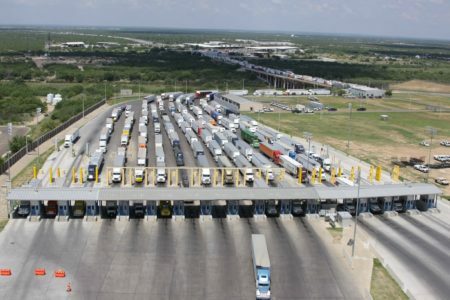 “I think Mexicans are going to go to the vote on July 1 with corruption in mind, with inequality in mind, with the lack of opportunities for all in mind,” Duhalt said, who added that distrust of both the PAN and PRI could be an additional factor. The PRI maintained control of the Mexican presidency for 71 years until 2000, when PAN candidate Vicente Fox defeated Francisco Labastida Ochoa. Twelve years later, voters elected a charismatic Peña Nieto, hopeful that his administration would stanch national corruption and violence. Instead, corruption skyrocketed during his presidency. (Tourists can take bus toursof Mexico City’s “monuments of corruption.”) Approval ratings for Peña Nieto fell as low as 12 percent last year according to Mexican newspapers, exacerbated by the 2014 death of 43 students “disappeared” and killed at the hands of police and federal officers in Iguala. Peña Nieto’s administration also failed to rein in violence. Since Mexico’s drug warswere launched by former president Felipe Calderon in 2007, the country has been riddled by persistent cartel bloodshed. 2017 was one of the deadliest years on record for Mexico, leaving more than 29,000 people dead. The death toll since the drug wars began has reached almost 250,000. While most of the coverage has focused on the national elections, candidate murders are on the rise in six Mexican states. In Guerrero, Michoacán, Chihuahua, Pueblo, Oaxaca and Quintana Roo, the count is at 48 deaths, according to a detailed list by El Universal. The Los Angeles Times reports that the killings could be part of widespread gang violence perpetrated to maintain control of territory and local government. Duhalt said that because this is Mexico’s biggest election, he isn’t surprised that violence is erupting. He speculates that clashes between supporters of opposing candidates could be a cause of unrest. Meanwhile, the PRI reportedly considered a proposal from Cambridge Analytica to help them win the election, but turned it down after months of deliberation. In December, then- U.S. National Security Adviser Lt. Gen. H.R. McMaster mentionedthe Mexican presidential race as a site of Russian interference, a suggestion that some analysts have echoed, and specifically On behalf of López Obrador’s campaign. But many experts, as well as the Mexican and Russian governments, have denied the existence of any such activity. What a new Mexican president could mean for the U.S. In addition to sharing a 1,900-mile border with the U.S., Mexico is also its third largest trading partner, shipping 610,000 barrels of crude oil north per day. While leading candidate López Obrador says he’ll protect NAFTA and crack down on unfavorable trade practices, some believe his hardline stance could do more harm than good. 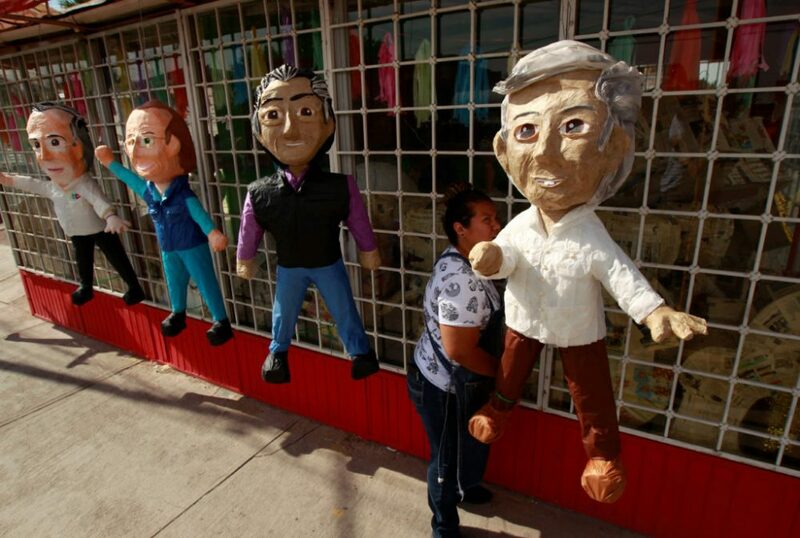 A woman hangs up pinatas for sale depicting Mexican presidential candidates outside a pinata store in Ciudad Juarez. “If López Obrador becomes president on July 1, he will have kind of a reality check” when it comes to trade policies, Duhalt said. 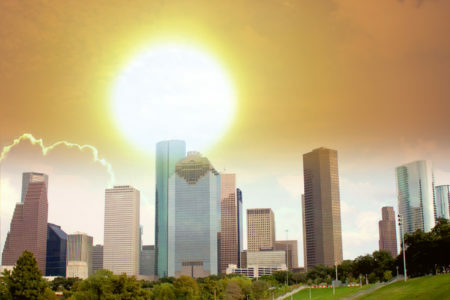 López Obrador would need to reconsider some of his far more insular energy trade practices — including plans to build more oil refineries in Mexico to decrease reliance on the U.S.– given how deep Mexico’s economic relationship with the United States is, Duhalt continued. U.S. trade with Mexico totaled an estimated $616.6 billion last year. “He needs to realize that international trade is important for Mexico,” and that Mexico sends about 80 percent of its exports to the U.S., Duhalt said. According to Reuters, Mexican companies are increasingly cautious about their investments, fearing López Obrador’s promises to reassess energy reforms, U.S. trade relations and a massive, billion-dollar airport construction project in Mexico City after the election. But Laborde said the relationship with President Trump hasn’t been a main focus of candidate platforms, though will become more of a concern once the election verdict is in, with NAFTA, immigration and national security — issues at the heart of Mexican stability and prosperity — topping the agenda. “I don’t see any possibility to rebuild peace in Mexico without working very close with the United States,” said Laborde — a challenging dynamic given the recent strain.